Not everyone loves a chilly morning in a wet countryside with laziness clinging to your side. You don't want to shake it off as the warm comforter refuses to let go. But then you need something that puts you out of this pleasant misery. A good cup of hot tea can do the trick but a hot soup is my favorite. A hot steaming soup that slowly crawls into your mouth greeting your lips, lighting up your palate, clearing your windpipe and literally waking you up is the one we love. 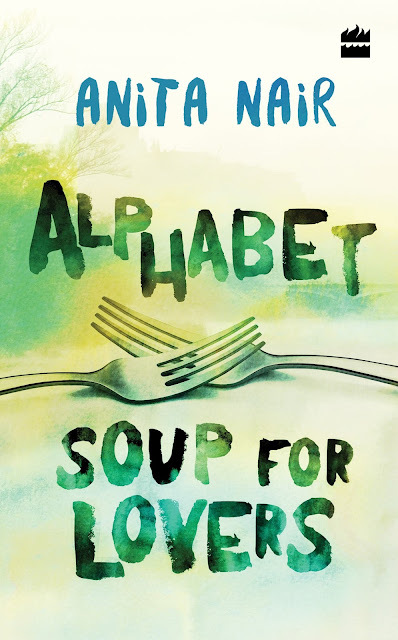 Alphabet Soup for Lovers by Anita Nair one such wake up call for all our settled lives. Set in a picturesque backdrop of a tea estate around a majestic house built in British architecture and lots of openness that lets you explore, implore and gives you the space to relax, think, evaluate. For hosts you have the young accomplished lawyer - KK, his wife Lena who finds it interesting to follow her own pursuits in decorating, teaching, taking care of kids at the crèche and finds peace in her routine walks. Everything is wet, warm, damp, cozy and comfortable in its own way. In comes the superstar who wants a break from his exciting routine that came to irritate him and finds this place offers him exactly that. At least that is what he was expecting. What happens next is what you need find out in the novella. Set to the theme of food and following what seems to be a trail of alphabetic order, the story presents you chaos in a warm tea cup. Many a time we choose to ignore what is there for us and take things for granted. This story narrated by the elderly, all observing Komathi who is fierce, motherly yet handles her role of the self-appointed caretaker well. The story is narrated in quick matter of fact way but with the right ingredients of love, passion, beauty and what nature can do to you if you allow it to play with your emotions. Something as morbid as a cemetery can turn into a cauldron of inhibitions and enormous possibilities. The fallen angel in a calm cemetery speaks volumes of the state we are in sometimes. Some dishes are to be relished when hot and can be tacky when they get cold, old and forgotten. The story of Komathi and Rayar is one such tale of a spicy beginning yet calm eternity while Lena chooses to add tadka to her life in her own terms. While this can be called another love story, Anita chooses to add spice to an exciting Malabar sojourn in a sweet way. The reader is left guessing for his own interpretations of the story and characters and where they would end up. The flow is smooth and creamy while the protagonists choose to stand out with their own textures adding character to this hot bowl of soup. At the end you are left refreshed but wanting for more. Say hello to possibilities and second chances. Pick it up today from here.